Extensive boardwalks grant access to bays and beaches at Rish Park. If you use a wheelchair, finding an accessible beach can be like searching for an elusive oasis. 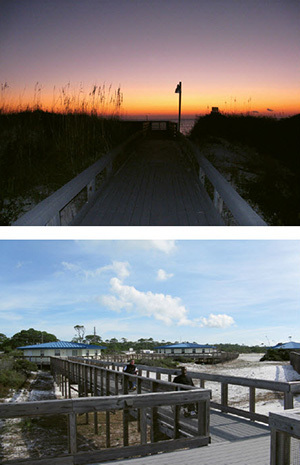 One of the unique features Rish Park offers is access to St. Joe Bay and the Gulf of Mexico, which are renowned for scallops, wildlife and estuaries. Visitors with the appropriate fishing permit will be welcome to capture their limit of scallops in St. Joe Bay. At the same time, the south side of the park drops visitors into miles of sugar white beaches that are known for seasonal sea turtle nesting.